Perceptive Automation on Tuesday announced the release of Indigo 4.0, a new version of its home automation server software for the Mac. It’s available in Lite and Pro versions for $90 and $180 respectively, and upgrade discounts are available. 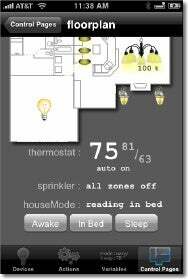 Using Indigo and physical modules connected to the wiring or appliances in your home, you can control lights, appliances, thermostats, lawn sprinklers and dozens of other items. It’s a way of running your whole house from your Mac. The new 4.0 release adds support for Indigo Touch, a new application that’s available for free download from the App Store. Indigo Touch makes it possible for an iPhone or iPod touch user to control their home automation server using Wi-Fi, 3G or EDGE connectivity. It supports Apple’s Bonjour zero-configuration networking technology as well as a subscription service called GoPrism that lets you access your server remotely and securely from any location without requiring special firewall or router configuration. Other changes in 4.0 include improvements to the built-in Web interface, additional support for access from other mobile hardware platforms, and the addition of RESTful-compliant Web APIs, for developers who want to add support for Indigo into their own applications. Indigo supports INSTEON-enabled home automation interfaces like the PowerLinc V2 (2414U), CM-11, LynX-PLC, MR26 and W800RF32. These interfaces connect a computer to INSTEON and X10 devices you can install in your home. Indigo Lite and Pro are similar to use, but Indigo Pro adds support for high-end devices and custom scripting. Indigo requires Mac OS X 10.4.11 or later. A 30-day trial version is available for download. If you’d like to try Indigo Touch but don’t have Indigo set up already, you can connect to Perceptive Automation’s demo server.